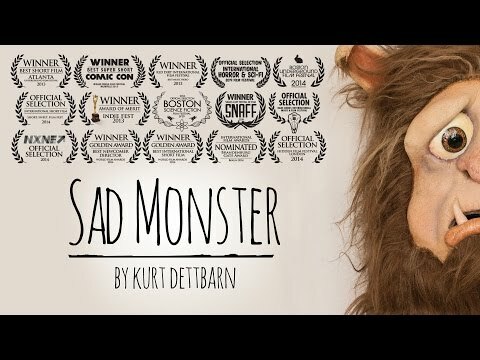 Sad Monster is a short film by Kurt Dettbarn, that won 7 Best Film Awards including Best Film at Comic Con, as well as 18 official film festival selections, a book deal and a meeting with Stan Lee. Kurt Dettbarn made this short film as a birthday present for his 3-year-old daughter. He wanted to capture the moments of his growing daughter before it was over. So, he wrote a song for her and sang it too. Then he designed a monster costume and then directed a short film featuring that song to present his daughter on her 3rd birthday. I filmed my daughter and never told her what it was for. I also kept the entire thing a secret from my wife. They cried when I revealed it, but what happened next was amazing. Director of Sad Monster, Kurt Dettbarn has also won several international awards such as Best Newcomer Director, Best International film and Best Music Video. Watch this beautiful short film, made with love by a father for his daughter.